(Bloomberg Opinion) -- House of Fraser Ltd. on Thursday announced plans to shut more than half of its department stores through a proposed company voluntary arrangement. This is a terrible blow to both the 6,000 employees that will be affected, and the many smaller clothing businesses that sell through concessions in House of Fraser. The cull is big: 31 of its 59 locations will go. It primarily involves large shops, including London's Oxford Street and the outlet in the City. 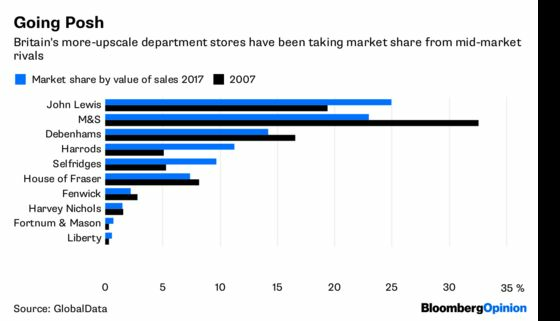 But with the spate of U.K. store closures announced since the start of this year, including from the likes of New Look and Mothercare Plc, and the sale of Homebase to Hilco, there is finally the potential for capacity to come out of the retail market. House of Fraser’s abandoned spaces are unlikely to be turned into other department stores. No competitor looks to be expanding significantly. Debenhams Plc has said it could close up to 10 stores, though it and John Lewis could cherry-pick individual locations. House of Fraser's move is likely to be accompanied by closing-down sales. In the short term, that would be unhelpful to its two big rivals. That could perhaps explain the drop in the share prices of Debenhams and M&S. But once things settle, sales that had previously been made through the affected outlets should migrate elsewhere. Even Marks and Spencer Group Plc could get a lift, particularly if chairman Archie Norman can make progress in improving its products and stores. House of Fraser had 7.4 percent of the U.K. department store market by value of sales in 2017, according to GlobalData. This year it has about 1.1 percent of the clothing market, and a 1.7 percent share of health and beauty. 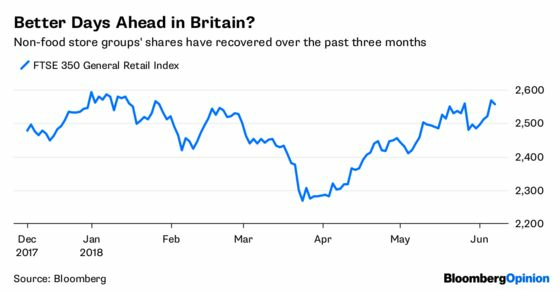 As I have argued, the retail apocalypse of the past few months could be the nadir for the British high street – though the recent pickup in fuel prices is a cause for caution. Wage growth has edged ahead of inflation, finally giving consumers the spending power they’d been missing. Unemployment is still at a record low. With capacity now coming out of the market, those chains that can navigate the next few months stand to be on a firmer footing going forward. There is no guarantee that that House of Fraser's CVA will go through. Landlords are becoming increasingly frustrated by the rash of restructurings. This one is particularly controversial, as new investment being dangled from C.banner International Holdings is contingent on it being approved. The CVA is unlikely to have been launched without some indication of support from investors and landlords, though some of the latter could take a stand against it. And even if it is agreed, as I’ve noted, the chain needs a plan to become more relevant to shoppers. There is no sign of that right now. House of Fraser said that without the CVA, it "does not have a viable future." If the controversial restructuring does not go ahead, then even more capacity could come out of the market. That would be a faster – and messier – affair. That could present an even bigger challenge to rivals in the short term – but ultimately, the survivors should still be in a better position.